It’s mid to late January. You can’t go sit in the stand anymore because deer season is over. But you still want to be out doing something related to deer. This time of year, deer enthusiasts across the country start hitting the timber in search of something else and that’s shed antlers. Shed hunting is something a lot of us look forward to doing every winter/spring, but when should you start? You don’t want to be out there too late. Things happen such as rodents getting a hold of them, or maybe others shed hunting on the property you do first. But in the same breath, you don’t want to start too early either. The last thing you want to do is push deer out of an area before they shed and then subsequently not have any antlers to look for. So when do you start? Here’s what I do. It can be an interesting dilemma knowing when to start searching for shed antlers. Trail Cameras: Trail cameras are far and away my best tool in helping me identify when I should start searching for sheds. Many people stop running cameras after the season, but they can provide you a lot of insightful information during the off-season, with one of those being when bucks shed. Where legal, a simple tactic is to put some type of food source in front of your camera. Corn or alfalfa bales is a popular option with many. I’ll check my cameras every couple weeks or so, and once it seems like “most” of the bucks have shed, I’ll dive into a property. Trail cameras can play a big role in helping you determine when to start searching for shed antlers. Pressure: This is something that I feel can be overlooked when deciding when to start searching for shed antlers. There are a few different situations that should dictate when you start your shed hunting adventures. If you have an area you think will be good for shed hunting on public land, waiting too long may mean that someone else gets in there a bunch first. So, how do you approach this? If possible, check the edges of the property every once and awhile looking for human sign. Boot tracks, tire tracks possibly, whatever the case may be, this can have an effect on when you take to the field. If your shed hunting spots aren’t getting any pressure or you’re lucky enough to own property, this changes things as well because then you can wait until the timing is just right later in the spring. 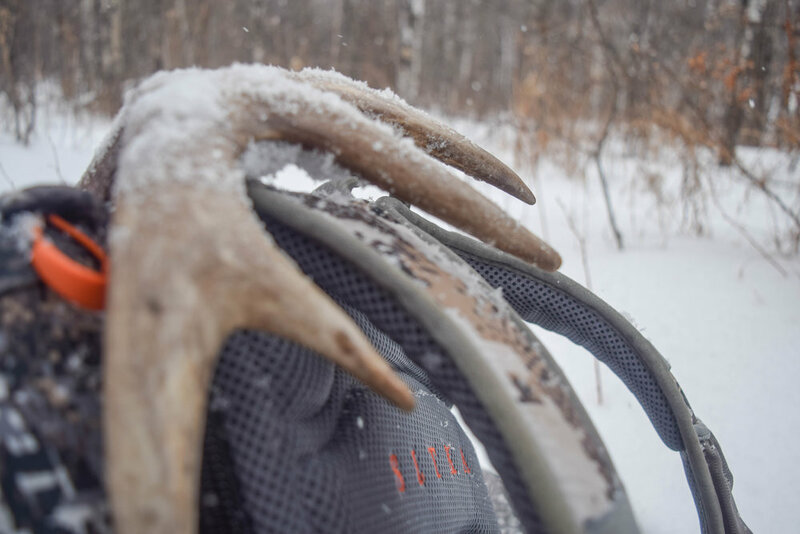 The best time to start shed hunting, all other factors not included, is when the snow has melted enough to expose much of the ground, but there’s still some left to help break up the browns and make it easier to see antlers. Other Factors: A few other factors when it comes to time of year relating to the start of shed hunting could include things such as your personal time or weather conditions. Let’s say that it’s mid-February and you know that most of your weekends are already filled during the back half of March and in April and those are the only times you can get out to shed hunt. The conditions might be more favorable for you to start in March. Maybe not all of the bucks have shed yet. BUT, just like hunting, there are certain times to capitalize, and that’s why if something like this situation presents itself, you should head for the field. It might not be perfect, but it’s not like you’d be scouring all of the timber in mid-December. When it comes to weather conditions, it can have quite the impact on your shed hunting abilities. Let’s use the winter of 2017 for instance. I was living in North Dakota and we had gotten a ton of snow in early December, but then it didn’t snow again for quite some time. Deer trails were like highways in the woods and by early February, we still hadn’t received a crazy amount of snowfall. My trail cameras told me a lot of bucks had shed, so I decided to head out in the snow. My couple of shed hunts in early February that year were awesome. The next week we got a dumping of snow, so any antlers that I didn’t find the week before would be covered up, and then I had to wait for the snow to melt in spring. So be sure you’re paying attention to the weather because when you use it properly, early shed hunting opportunities may present themselves. Conclusion: There’s a lot of factors that come into play when determining when to start searching for these spring treasurers. So before you begin, or as you evaluate when to start shed hunting, take these things into consideration.